"B" goods This product normally has hooks for wall hanging, but in one batch the hooks were sewn incorrectly so the cases hang upside down. However, these "seconds" have been tested and hang suitably from the carrying handle. They are offered at a 40% savings while they last. 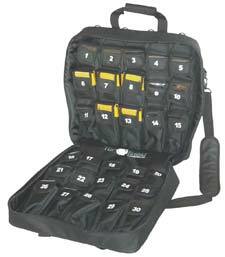 The Top Rhino soft case Graphersack TR-30SC-B has 30 numbered pockets for graphing calculators like the TI-84 or Nspire CX. Also fits TI-10 and TI-15. Pocket flaps have windows to check inventory at a glance. Zip-up case has carry handles, shoulder strap, and outside pockets. Case can be hung open on a wall by its carry handle. Measures 19" x 19" x 6.25" (zipped), and weighs 7 lbs empty.